Native plants are beautiful and interesting, but they are not an end in themselves. They cooperate with other biological or ecological factors such as climate and geology to create resilient habitat. Everything works together! Any day now, the Pacific Chorus Frogs (a.k.a. 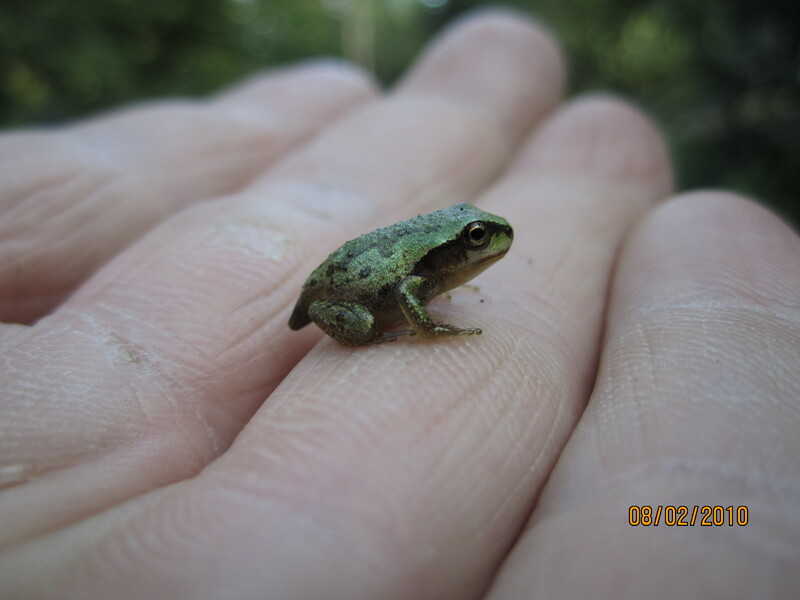 Pacific Treefrog) will start raising a ruckus in the wetlands around Tadpole Haven. So far, the weather has been too cold for them. They have already begun calling in warmer parts of the Puget Sound region, such as Seattle. This time of year, they migrate toward water to find mates. The males are the noisy ones! Once they breed, the females lay their brown-and-cream colored eggs in golf-ball-sized clumps of clear jelly on plants and twigs along sunny, well-vegetated shorelines. They seem to prefer to lay their eggs on thin twigs and stems; sedges, rushes, Marsh Cinquefoil (Comarum palustre), and stems of Red Twig Dogwood (Cornus sericea) that have draped into the water are some common choices. The ideal pond for Chorus Frog breeding dries up in late summer, making it an unattractive place for the predatory, invasive Bullfrog, which needs year-round water.